For work, schools and other organizations, you may have a need for these professional certificate templates. 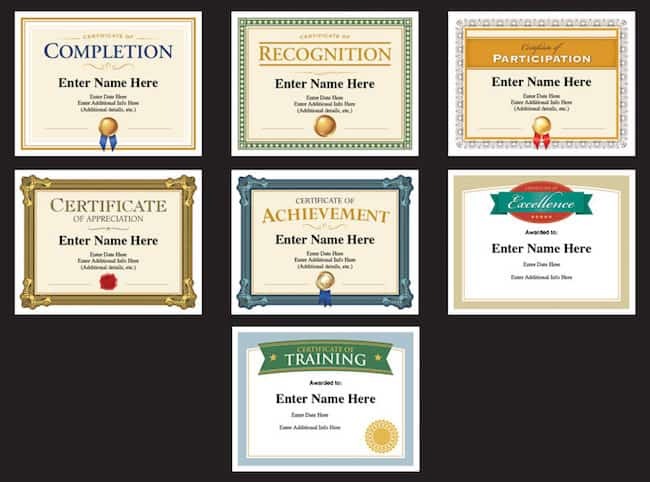 Create a great looking award certificate in a manner of seconds and leave recipients feeling great about themselves. You can personalize each certificate in the text fields with the recipient’s name, organization’s name, date, and words of recognition and praise. Use time and time again. They’re simple to use and work on Macs and PCS. You receive a PDF file to save on your desktop. Suitable for framing, but many recipients will simply post the award on an office cubicle, bulletin board or home refrigerator. Classy looking and fun to receive. 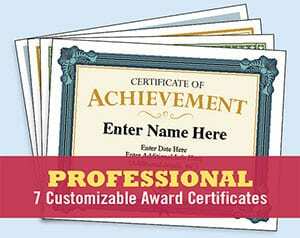 Customize each certificate to meet your specific need. Just personalize, print and present! Professional Certificate Templates – Achievement & More!